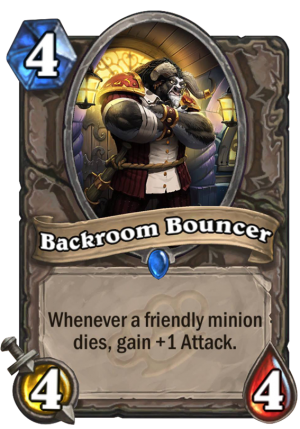 Backroom Bouncer is a 4 Mana Cost Rare Neutral Minion card from the Mean Streets of Gadgetzan set! "WHY ARE YOU IN THE BACK ROOM? WHO IS WATCHING THE FRONT?!" Rating: 1.9/5. From 1148 votes. Why not to play this guy before sacrificing your murlocs with a big taunt? Next turn could be lethal with Power Overwhelming and Soulfire. Why on earth would you ever play this over flesheating ghoul? 1 more mana for +3/+1, seems legit to me. Questions is, would people use flesh eating ghoul if it was a 3/3. You forget the fact that it says “freindly” minon. This means it powers up significantly slower than Flesh Eating Ghoul.